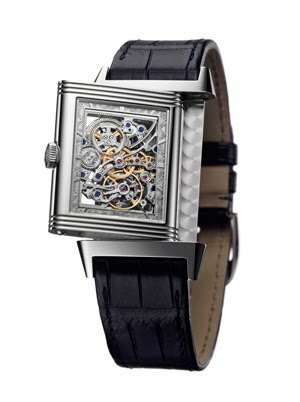 A steel labyrinth; a watch with two finely crafted faces. The Grande Reverso Ultra Thin Squelette lends its dual nature to the ancestral art of openworking, thereby serving as the emissary of an artistic and technical expertise mastered by only a very few watch manufacturers. Entirely openworked and decorated by hand, the mechanical movement reveals its wheel-trains fascinatingly interwoven according to a purposefully created design that leaves nothing to chance. The artisan has patiently removed material using the blade of a small saw in order to reduce the mechanism to bare essentials, while nonetheless ensuring its flawless reliability. All the sides have been individually hand-drawn, chamfered, polished, chased and engraved. Blued screws are dotted across this delicate lacework, while the jewels are there as a reminder that this is a first-rate mechanical manually-wound movement, Jaeger-LeCoultre Calibre 849RSQ. The latter has become a legend because of its exceptional qualities including a frequency of 21,600 vibrations per hour and an ultra-thin 1.85 mm thickness comprising 128 parts. Its extremely slender architecture calls for exceptional machining precision, while its openworking adds to the complexity of the task and represents an impressive accomplishment. In order to honour this exquisitely meticulous work, the white gold dial is framed by finely engraved arabesques, accompanied on the front by a blue-tinted translucent enamel coating echoing the traditional colour of the blued hands. 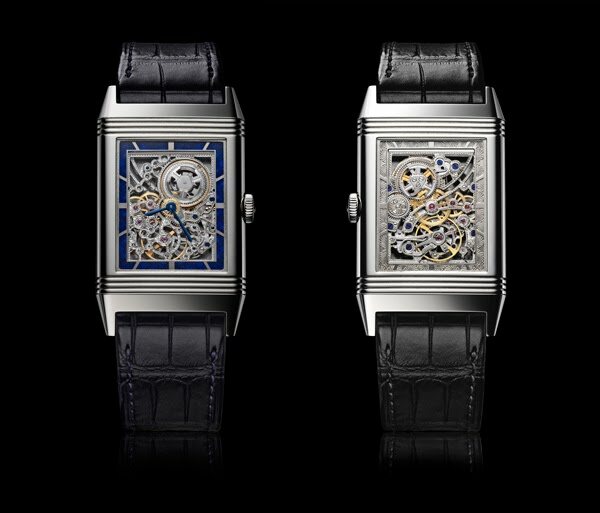 Issued in a 50-piece limited edition, the Grande Reverso Ultra Thin SQ radiates emblematic Art Deco lines and peerless finesse highlighted by rare forms of craftsmanship inherited from the past and handed down from generation to generation within the Manufacture.